Doha (AFP) – Paris Saint-Germain’s latest bruising exit from the European football Champions League may have been particularly painful for two men watching among the almost 50,000-strong crowd at Parc des Princes. 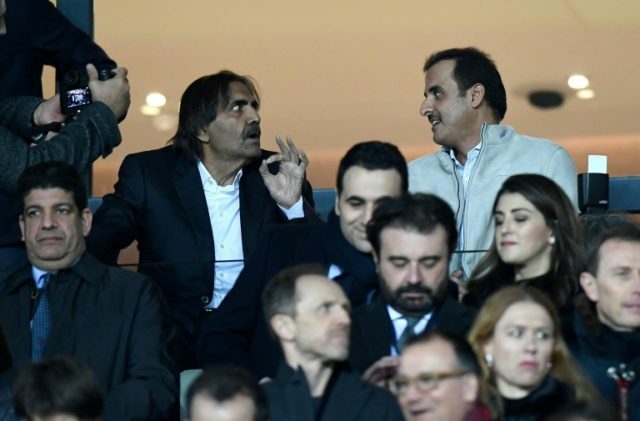 High in the stands in the Paris stadium were Qatar’s Emir Sheikh Tamim bin Hamad Al-Thani and the former ruler, his father Sheikh Hamad bin Khalifa Al-Thani — who together have helped bankroll the French team’s obsession with landing club football’s biggest prize: the European Cup. Tuesday’s limp defeat, even if by Real Madrid, seems scant return for the more than one billion euros poured into PSG since Qatar Sports Investments (QSI) bought the French club in 2011. This was meant to be the year the club — having signed Neymar and Kylian Mbappe for a combined 402 million euros ($499 million) — joined European football’s elite. Instead, PSG has failed to realise its ambitions, crucially at a time when Qatar is at the centre of a bitter political conflict with neighbouring former allies in the Gulf. Even more galling for Qatar and PSG is that one of the favourites this year is Abu Dhabi-owned Manchester City. Those involved with PSG say there is no chance of Qatar turning its back on the club. “The project is not stopping,” said a source close to the club. Nasser Al-Khelaifi, who simultaneously serves as chairman of QSI and president of PSG — in addition to being a tennis buddy of the current emir — spoke immediately after the humbling defeat about taking time to reflect, despite being “upset”. “Short-term, the club’s Neymar-powered, Gulf feud-busting tactics would appear to be at an end,” said Simon Chadwick, a professor of Sports Enterprise at Britain’s Salford University and a member of a Qatari government sport think tank. Success “requires sustained investment in talent acquisition and development”, he adds, not just the occasional big name signing. Patience, though, is not a highly regarded virtue in modern-day football, even though the experience of “nouveau-riche” clubs such as England’s Chelsea and Manchester City demonstrate it takes time for a team to establish itself among Europe’s traditional elite. For those directly involved with the day-to-day running of PSG, reflection on the Real defeat is likely to take the form of what to do with coach Unai Emery and Neymar. Paris-based French football specialist Jonathan Johnson says the latest failure will see “heads roll” and even speculates that Khelaifi may be for “the chopping block”. For Qatar, what to do next with PSG seems to be a matter of broader considerations, including international politics, diplomacy and finance. The emirate has exploited sport to pursue a soft power approach to improving its global image. This effort has reached its height in football, through PSG and the country’s winning bid to host the 2022 World Cup. “Overall, there’s no doubt that Qatar’s six-year involvement with PSG has been a soft power success,” says Christopher Davidson, a professor in Middle East politics at Durham University. Financing the PSG European dream though is key. One billion euros may sound a lot but is equal only to a fortnight’s spending on World Cup preparations for Qatar. And despite its vast gas riches, the boycott by its regional rivals has hit Doha’s economy. “The economic blockade drags on and no real end is in sight,” Davidson said.